Consulting, Media Relations & Social Media Promotion for the World Premiere of SURVIVE! The performing arts collective behind Philly Fringe hits Purr, Pull, Reign: A Litigious Fantasy in D (’09), The Giant Squid (’08) and The Ballad of Joe Hill (‘06) has established Swim Pony Performing Arts, an independent Philadelphia-based theater company dedicated to producing entirely original new work. In June, the newly-minted Swim Pony will present the World Premiere of SURVIVE!– a site-specific performance and interactive theater experience exploring science, humanity and the Universe, directed by Adrienne Mackey, Artistic Director of Swim Pony. In SURVIVE!, Swim Pony Performing Arts invites audiences to explore human life from many angles in a collective journey to understand how humans, space and science are interconnected. Under the guidance of a “10th dimensional narrator”, the cast of SURVIVE! will lead audiences through a maze-like installation covering over 20,000 square feet of The Wolf Building. An interactive performance, audience members choose their own adventure and move through SURVIVE! freely, generating a unique experience with each viewing. Audiences travel through a walkway to space, visit a biotic terrarium, the living room of a gentle scientist, and more to uncover the meaning of human existence. Through image, sound, spectacle and an experiential journey, the production asks audiences to open their minds, evolve and survive. SURVIVE! will transform The Wolf Building, located at 340 North 12th Street in Philadelphia, from June 4 – 20, 2010 (opening night is Friday, June 4 at 8pm). All tickets are $20 and tickets are available for advance purchase online via Brown Paper Tickets or by calling the ticket sales hotline at 1-800-838-3006. Visit www.swimpony.org for updates. Swim Pony Performing Arts is an independent Philadelphia-based theater collective dedicated to producing entirely new work that is original, strange and loud. Established in 2010, under the direction of Adrienne Mackey, Swim Pony’s mission is to create works of live performance that seduce and surprise audiences. All Swim Pony productions are created collaboratively by a rotating team of energetic theater artists actively working in Philadelphia’s vibrant arts and cultural community. Swim Pony Performing Arts, Adventurous New Theater Company Debuts in Philly with SURVIVE! Part performance, part art exhibit, part wandering through a maze, and part choose-your-own-adventure story, SURVIVE! takes on themes of science and humanity’s existence in the universe in an extremely quirky way. 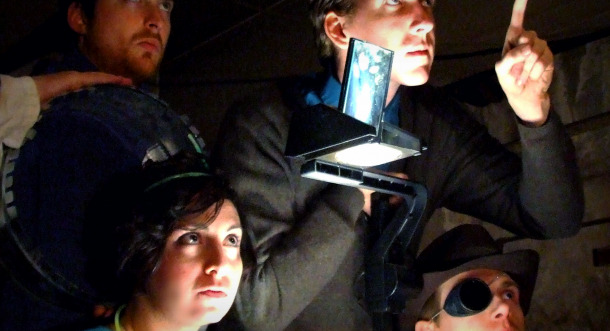 Audience members will wander through 20,000 square feet of the Wolf Building (one of Philly’s favorite experimental theatre spaces), guided by “a tenth dimensional narrator” named AMA. Should you ever have the opportunity to stroll into the fourth dimension, you might be surprised to find it looks very much like an IKEA waiting room. That is but one of the insights into the dark places of our Universe (and it’s hippy friends, the Multiverse) as put forth by part-theater troupe/part-science experiment Swim Pony. The immersive audience experience turns the micro into the macro, and back again. Audiences begin at the nucleus of the underground space in the Wolf Building, then BANG – fragmented and “pulsed” outward into one of the many rooms where they trip through the vacuum space between stars, enter the TV studio of a show-and-tell scientist, or browse modular furniture. Then the audience is sucked back to the center, and “pulsed” outward again into another room. The artistic director says during any one visit the pulsing audience may only witness about 30% of the prepared material; such are the limits of mortal consciousness inside infinite space. Life is cycling energy: return visits are encouraged.